Volonteurope is an international network promoting volunteering, active citizenship and social justice in Europe and beyond. Volonteurope works at all levels, from the local to the international, and across the public, private and third sectors. We facilitate exchange, foster collaboration, and carry out research and advocacy. Volonteurope currently has over 50 members in more than 20 countries across Europe. 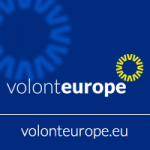 Established in the Netherlands in 1981, Volonteurope’s Secretariat is hosted by Volunteering Matters, the UK’s leading volunteering charity in policy and practice. Volonteurope is also involved in Erasmus+ projects, working with young people with fewer opportunities, developing volunteer and volunteer management training, and introducing innovative approaches to citizenship education; an EU Aid Volunteers technical assistance project, aiming to prepare volunteering organisations to deploy volunteers abroad; and Advocacy work on a number of issues including migration, social protection and sustainable development. Vision: Volonteurope’s vision is of a world in which the principles of inclusiveness, collaboration, sustainability and fairness guide thinking, behaviour and practice in Europe, resulting in genuine social justice for all. Mission: Volonteurope’s mission is to work collaboratively with our members and partners to champion the role of volunteering and active citizenship as pathways for social justice in Europe and beyond.